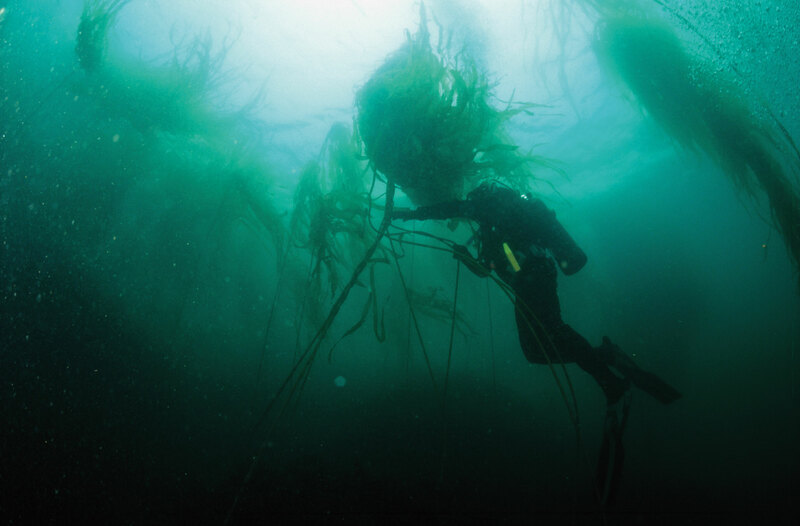 Kodiak is a diver’s paradise with enchanting kelp forests inhabited by colorful and curious creatures. I got my PADI diver’s license in 1980 while working on the Maldives in the Indian Ocean. Since then, I have explored most of the premier diving sites of the world, like the Great Barrier Reef in Australia, the Red Sea, the Andaman Islands south of Burma, the West Indies, and the South Pacific. But few places are as rich in fish, shellfish and other marine wildlife as the coral gardens and kelp forests that surround Kodiak. A calm, sunny day in Kodiak waters is one of the most exciting dives a diver will ever experience. There are many odd and colorful creatures in the ocean around the Kodiak islands. Besides the five species of salmon, there are several species of cod, herring, halibut, starfish in every color of the rainbow, sea cucumbers, octopi, shellfish, sea otters, several kinds of whales, and the giant salmon shark. My first dive on Kodiak was off the shores of Fort Abercrombie. After a few minutes in the water, two curious sea lions approached me, poking at my diving equipment. On land sea lions are large and cumbersome animals, but in the water they are elegant and graceful. Their familiarity was both exciting and alarming. One little nibble on my rubber air hose could have had devastating consequences. But they soon decided that I was a rather boring playmate and left me and my equipment without harm. In the 1940s and 1950s, new radar equipment revealed large hoards of king crabs in the waters around Kodiak. This discovery launched a boom in the fishing industry, and in just five years, Kodiak was transformed from a small fishing community to one of the largest commercial fishing ports in the United States. Annual catches of up to 100 million pounds were pulled from the waters around Kodiak and delivered to the canneries. Commercial fishing of king crabs continued for 25 years. Then, in the 1970s, the population of king crabs dwindled. By 1982, the catch was so poor that fishing was stopped. No one knows for sure why the king crabs disappeared, but researchers believe that overfishing could be one of the main factors. Pete Cummiskey, one of my good friends on Kodiak, is a diver and marine biologist who has been working with the king crabs since the mid-80s. I asked him to show me the crab pods. There is protection in numbers, so juvenile crabs group together in giant balls to protect themselves from predators. A large pod can have several thousand crabs. One gorgeous but cold November day, we went out in Womens Bay in search of crabs. Earlier that year, Pete had tagged several individuals and attached transmitters to their shells. Pete lowered the receiver into the water and soon picked up a signal. We prepared for our dive. The pod was about 90-120 feet down, engulfed in a dense cloud of sediment churned up by the crabs. It was so thick, I couldn’t see my hand in front of my face, and it took a few minutes to locate the pod. Because of the poor visibility, I had to get really close to the crabs in order to film. The king crab is an impressive animal with a leg span of up to 6 feet across, and with large powerful claws that could easily snap off a finger. As they get older and larger they are less dependent on the pod, but the crabs in the pod I was filming were still fairly large. Lying on the bottom, trying to get as close as I could with my camera, I felt the sharp pinch of a claw grabbing on to my arm through my thick diver’s suit. It was so painful I almost dropped the camera. I tried to pull the crab away, but it refused to let go. I realized that the only way to free myself from the monster was to rise to the surface. Halfway up, the crab finally let go and sank to the bottom. I had learned my lesson – Give the king crabs a wide berth! I did descend again, however, and resumed my filming of the remarkable crab pods on the bottom of Womens Bay, keeping a respectful distance. We located more pods and made several dives in the bay that day. Through his research, Pete has learned a lot about the king crabs’ environment and their migration along the ocean floor. Hopefully his research will lead to a rejuvenation of the king crab population so that commercial fishing of this wonderful delicacy can resume on Kodiak.